Hi, this Justin Paperny. Today I will discuss 16 ways to mitigate the impact of a prison sentence. “Mitigate (verb): make less severe, serious, or painful. Without question most everyone one in prison would rather not be there. But if you have to go, let’s make the time less severe, serious, and painful. Last week on a call with a white-collar defense attorney I suggested only 1% of white collar defendants prepare properly. He was taken aback at the 1% number. For clarity, this 1% is not about income, but rather effort, commitment, transparency and discipline. This 1% embraces the reality that imprisonment is but a blip in their life, understands it is harder on their family, and understands the real work is learning to overcoming the consequences of a felony conviction, not just imprisonment. “But 99% of defendants do not return to prison,” he correctly pointed out. “Most people who come across my work will never return to prison. My readers are not criminals, but rather people who made some bad decisions without considering the long-term consequences. The 99% refers to how many federal prisoners, regardless of the length of their prison term, continue to deal with issues once they are released. I posit that their post prison life would be more successful if they paid more attention to how they served time, or learned how to mitigate the impact of their prison sentence,” I told him. “What are the major issues,” he wondered. I do not mean to belabor this 99% number to scare people. Rather I ask those who might spend time in federal prison to embrace it. If you question these numbers, just look at the data. If it were easy the data would look different. One-percent would be failing, and 99% would be succeeding. Success before, during, and after federal prison cannot happen without a deliberate plan. I approach it like preparing to go to college. A blog or YouTube video is a good start, but it cannot replace the value of preparing each day. Some believe it can be done with little effort. If you are one of them, there are other places besides our company to go. There are plenty of charlatans who will gladly offer you a guarantee or tell you it can easily be done, then take your money. Here you will find a more disciplined, data driven approach to transforming federal prison sentences into extra-ordinary opportunities. For clarity, I do appreciate that some in my field have an interest in helping others. But the problem is too many obsess over just “getting out of prison” or “shortening your prison term.” After all look at those who simply produce content like, “Guaranteed to Get You the Lowest Possible Prison Sentence,” or, “How to Get Out of Federal Prison Early Through RDAP,” or, “How to Get More Halfway House Time,” and on and on. Now, I am not an imbecile. I recognize those are hot button words white-collar defendants want to hear. And to be 100% open, I am also guilty of producing such content. There is value in it. Any reader, however, who does their due diligence knows I produce tons of content beyond just “how to shorten your prison term”, or “how to get into RDAP.” We must do more than focus on just getting out of prison. The 1% of people that choose to really work recognize their struggle is temporary. Any prison consultant, this one included, will review or offer a prison checklist to master, including: shopping in the prison commissary, bunk assignments, written and unwritten rules of prison, administrative remedies, prison hustle, email, money, and more. 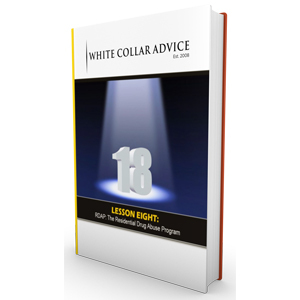 But part of the reason I call my company White Collar Advice is because so much of the work we do will focus on “what the rest of your life will look like because you went to prison.” It is not just about your time spent in federal prison. At some point those doors will open–the onus is on you to be ready. What good does it do to release to a new whole set of complexities? Some prisoners, including white collar offenders, turn down their halfway house time and stay in prison longer for a reason: they are not ready. The evidence, I think shows that practically everything we teach here is contrary to what others even attempt to teach. Our lessons are rooted in data, not scare tactics. Our strategies are rooted in reason, not emotion. Our case studies and testimonials are real, not manufactured from thin air. We offer no easy button. We simply offer strategies and solutions that have been time tested and proven to work. The reality is this takes deliberate, daily work. Too many federal prisoners do the same thing they did before and expect a different result. Our clients react differently. If something is not working they access, then pivot. The data guides them, not what the majority of other prisoners might be doing. J Paul Getty said: “No man rises above mediocrity who does not capitalize on the experience of others.” I agree. I myself have leveraged off the experience of others. I have often paid for that advice and benefitted tremendously. The question is who you want to get that experience from. Thankfully, hundreds have trusted us to offer that advice. We believe our track record proves we are the indisputable leader in our industry. But you must do due your own diligence and draw your own conclusion. At this point I would like to turn my attention to how any federal prisoner can mitigate a prison sentence. I spent some time over the last week writing out some rules to follow. Of course, this list can be expanded many times over and it could be easily converted into a book. If federal prison is in your future, I hope you find these 16 rules valuable and implement them immediately upon your surrender to federal prison. A huge distinguishing characteristic of successful prisoners who mitigate their sentence from this who do not is the seriousness of their routine. As I wrote in Lessons From Prison, “If they say they are going to do something, they do it.” Maintaining discipline is an essential ingredient to mitigating a federal prison experience. Embracing their underdog status allows them to make big, bold decisions. They realize that every leader has some doubt, but they risked it and did it anyway. As a result, they avoid the long term guaranteed suffering that impacts so many who sit on the sidelines. Making bold decisions can elicit negative feedback. I have gotten my share of criticisms, some warranted. Never forget it is too easy to criticize from the sidelines. Machiavelli wrote, “Fortune favors the bold.” Indeed. Besides setting clear goals, prisoners who mitigate a prison sentence identify the areas of skill and expertise they must acquire to overcome the obstacles that await them. Overcoming these obstacles overrides all other prison activities like talking about which Kardashian sister is hotter (the mother actually won a straw poll in prison). They don’t offer statements, such as, “I do not know the right people,” or “I do not know how.” Successful prisoners keep going and do not give into the Bureau of Prisons motto of, “You got nothing coming.” Once they hit a wall, they do not stop. They keep going and they move forward regardless of their current circumstances. Delay, I think, comes from doubt. Successful prisoners are not distracted or lazy. They don’t say, “I will start on that tomorrow.” Again and again I heard prisoners say, “I will start when I have 6 months to the house,” prison talk for halfway house. There has to be an immense desire to want it. Those that take incremental action never look back with regret. I know I was. While others thought it was odd for me to measure how many my miles I ran or how many blogs I wrote, I knew that I needed to measure my progress over time. Don’t just say you will read books, write out how many you will read. 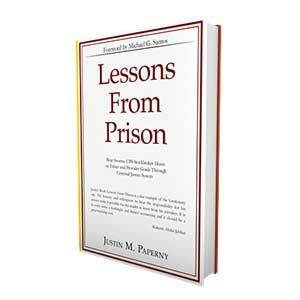 Successful prisoners who mitigate their sentence look around and learn from those who have succeeded. I was fortunate to have that mentor in Michael Santos. Successful prisoners are confident enough to put themselves out there, to try. That confidence allows them to solicit feedback from their mentors and network. Besides listening attentively to the advice of others, successful prisoners map out a strategy and follow up with those who have given the time to help them. These prisoners recognize that growing your network is akin to growing your net worth. It takes time. When I watched golf or a little TV in prison, I did so because I needed to recharge my batteries and shut down for a bit. Serving time in prison can be challenging and crises can pop up along the way. While some might think taking a break is unproductive, the successful prisoner recognizes that stepping away every now and again is essential to achieving any goal. Successful prisoners don’t offer clichés and slogans about what’s important to them. They don’t talk about it. They identify their values, get to work, and they live faithfully to them, whatever those values might be. Presuming their plans are realistic, and they are seeking feedback from people they admire, the successful prisoner who mitigates has the courage to stay the course. If you have passion, confidence, and most important discipline, eventually your efforts will bear fruit. Unsuccessful prisoners too often speak about what they want: big money, big house, nice cars, respect. Certainly successful prisoners want these things to. Obtaining these things, whether you are in prison or not, is difficult. Successful prisoners do not look at obtaining their goals as work. Further, they embrace the struggle and find the means as important as the end itself. Successful prisoners recognize that their loved ones suffer more than them. As a result, they don’t complain and they work daily to prove worthy of the love others bestow upon them. Without integrity nothing is possible. Successful prisoners understand that others will look at them skeptically, and potentially judge them for the decisions that led them to federal prison. Rather than telling people they have integrity, they create a record that demonstrates their integrity and credibility and proves that they can be trusted. These prisoners embrace or see the world as it is, not as they would like it to be. Embracing that reality, including how others will view them, will require the successful prisoner to maintain integrity even when telling the truth might be difficult or ugly. Embracing these rules will ensure that any defendant leaves prison ready to overcome all that awaits them. I hope you found this useful. If you have thoughts or questions, do not hesitate to reach out. Simply click here to schedule a call.